Fast, reliable, relatively lightweight, and most importantly - intuitive. 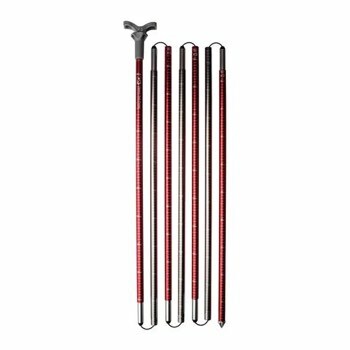 G3 has the right probes in the Speed Tech series of probes for when it really counts. The ultrafast single pull deployment system is intuitive and easy to use, saving valuable seconds when it matters most. 1 Hold cable end-loop in one hand and gently toss tubes away from body. 2 While holding tube nearest you, pull cable loop and gently shake tubes into alignment. 3 Align all tube sections to form probe. 4 Slide red nut onto the now protruding silver screw. Grasp end of protruding silver screw with your thumb and forefinger. 5 Rotate red nut clockwise to engage threading while holding screw stationary. IMPORTANT NOTE: Do not over tighten red nut. Excess tension along the length of the probe will cause probe to flex unnecessarily. Optimal performance is achieved when red nut and silver screw are finger-tight. Unscrew red nut while holding silver screw stationary. From tip end, pull apart tubes sequentially and fold into protective bag. In 1995 G3's founder, Oliver Steffen, developed his first product. He followed one fundamental rule: G3 gear must be true "guide gear". That product was an innovative, and dependable avalanche probe that set a new standard for function and reliability in the backcountry ski market. Since then, G3's team has steadily raised the bar for backcountry gear, with innovations including the TARGA telemark binding, High Performance Climbing Skins, AviTECH shovel, and Bonesaw. Each of these products has been developed and tested for guides and avalanche professionals; essentials in the professional's kit that must be strong, light, reliable, and functional. Our newest product innovation is one inspired by many years of combining skiing experience and product design. After two full years of intensive market research, development, and testing, G3 Skis are now available.